Mitchell Crane started reverse engineering in the 1980s and has successfully produced and sold reverse engineered crane parts ever since. Once customers started to use our parts they began to tell other crane operators about how they got a great price on a new part which was readily available and working great in their machine. 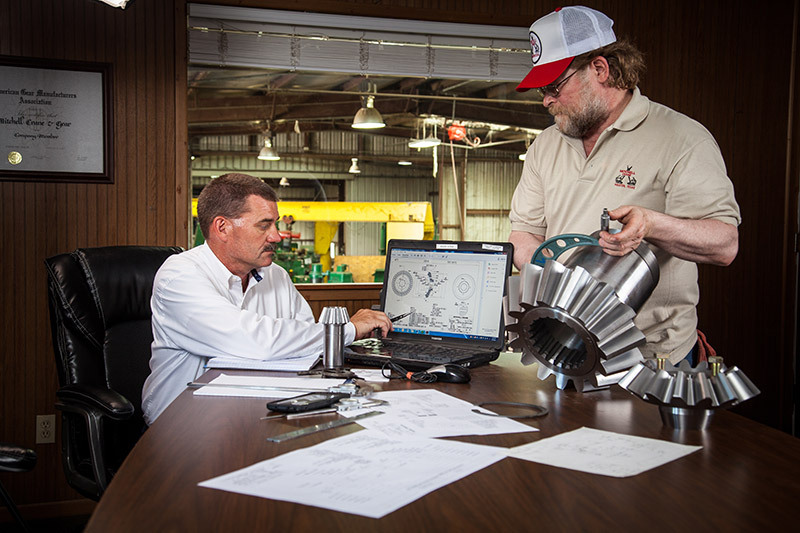 With room to grow Mitchell Crane is ready to help you get the parts you need. Customers regularly come to us with a broken or worn out part that they have either not been able to find a replacement for, the original manufacturer is out of stock of or the price from other sources is simply too high. These parts are not typically crane parts, we have made tiller parts, out-board marine motor parts and gears for NASA just to name a few examples. If you are having difficulties finding a replacement part we encourage you to call us in order to discuss the viability, cost effectiveness and time frame for producing an aftermarket version of your needed part. Often we are able to give you an accurate estimate of price and time to complete your part with a phone call, a few basic dimensions taken with a measuring tape and a few pictures. Note that when sending gears or parts which require special cutters we may need to have the part here in order to determine specific details such as gear tooth pressure point and pitch prior to being able to give an accurate estimate. Mitchell Crane has procedures in place for expediting manufacturing times so you are not stuck with a 16-week back order, in fact most turn around times are less than two weeks for a part we have never made before. In the event you are unable to wait or are in an emergency situation we have the people and resources to work 24 hours a day 7 days a week until your part is completed.